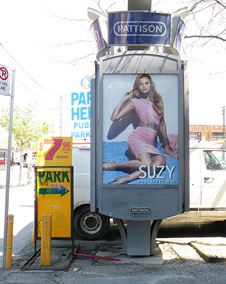 ToSAT (Toronto Street Advertising Takeover) is the first international street ad takeover project. 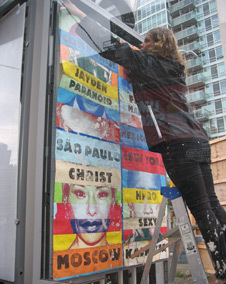 Working in Toronto with the Pattison Outdoor Core Media Pillars, the event included 60 artists from around the world and removed over 90 street levels ads as well as nearly 20 billboards from Toronto's public environment. 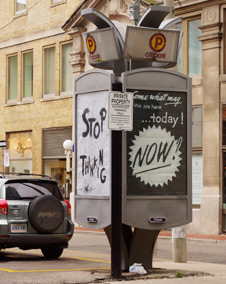 While we would like to thank all of the artists who submitted work, without which this project could not have happened, we owe an incredible debt to local Toronto street artists PosterChild and Sean Martindale for their on the ground support and unending dedication to the cause. As well, a special thanks must go out to Martin Reis whose photographic support provided imagery of the streets without which we would have been blind. Lastly and not least, this project could not have taken place without the DUSPA collective and the incredible group of volunteers who risked arrest to install all of the work as well as help plan this wonderful event. Given the complete success of this event, we hope the TOSAT project will provide us with both a model and the confidence to bring this type of large scale non-violent civil disobedience project to cities abroad in the years to come.